With virtual live tours, mixed-reality formats, a new app and Facebook presence plus an innovative parking concept, the Porsche Museum is picking up the pace with its digital offering. With immediate effect, people from all over the world can also experience the sports car manufacturer's museum virtually in real time. Fans can follow a museum guide on the http://www.porsche.com/museum/en/ website from the convenience of their screen at home through the special exhibition entitled “New ways. Every aim. Always Porsche.” Porsche fans who live too far to visit in person will be among those set to benefit from the new virtual tour. The digital experience is being further extended within the permanent exhibition using “Microsoft HoloLens” technology: During the “Porsche Holographic Design Tour”, a hologram of Porsche Designer Matthias Kulla explains the classic design features and design language of Porsche using a real 911 as an example. To interact with this technology, visitors put on a pair of glasses that projects interactive 3D animations onto a real 911. “This format gives visitors a unique experience within an architecturally appealing environment”, explains Achim Stejskal. The Porsche Museum and the Porsche Style design department have developed this experience in cooperation with Microsoft. Parking at the museum is also being improved thanks to a new digital feature: Visitors to the Porsche Museum can now enjoy much faster access to the museum. The barrier to the underground museum car park is opened with an electronic parking ticket stored in the vehicle, and in future the barrier will open automatically. This new feature means that there is no need for drivers to obtain a paper ticket, and parking charges can be settled conveniently at the end of the month. Cologne-based start-up company Evopark developed the app that has made it all possible. The app also shows free spaces in the underground car park and navigates drivers directly to a space by request. Visitors can now arrange their time on-site at the Porsche Museum in a more personalized way: Using the free “Porsche Museum” app, visitors can access all of the information they need for their own tour through the exhibition as well as the technical data that accompanies the exhibits. Information about opening times and prices complete the offering from the app, which is available for iOS devices in the Apple App Store and for Android devices in the Google Play Store. 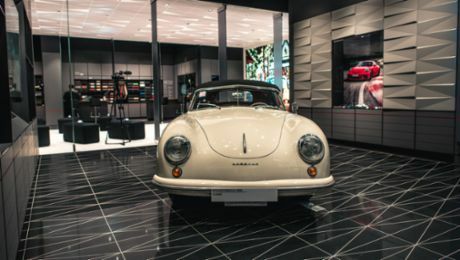 During their tour of the exhibition, visitors can also choose their favorite vehicles from among the exhibits and share them on social networking platforms in the form of an electronic post card, making the “Porsche Museum” app a useful companion for well-connected culture and car fanatics. On www.facebook.com/porsche.museum.stuttgart/, the museum curators share detailed insights into the company history as well as actively taking their followers with them when they attend rally experiences around the world or the museum's own events. Porsche fans can share their likes and comments on social networking sites in real-time during their visit to the museum by logging into the free on-site Wifi available throughout the entire building. Porsche Centres across Canada are the first Porsche dealers worldwide to offer virtual guided tours. Porsche and Tongji University in Shanghai have expressed a desire to strengthen their cooperation. The first Porsche Studio in Southeast Asia has opened its doors in one of Asia’s most dynamic cities.